Oranges are not only sweet and delicious but also they are very healthy. Latest research, which will be published in the April issue of Stroke: Journal of the American Heart Association, provides another reason to eat oranges and citrus fruits on a regular basis. While past research showed that oranges reduce cholesterol levels and decrease blood pressure, this new observational study suggests that they reduce stroke risk as well. This research shows that naturally occurring compounds called flavanones in citrus fruits are linked to reduced risk for ischemic stroke in women. Ischemic stroke occurs if there is a decrease in blood supply to the brain due to a blocked artery. The compounds also improve blood circulation, reduce inflammation and improve overall cardiovascular health. The researchers followed a group of 70,000 women participating in the Nurses' Health Study for 14 years. Women in the study filled out questionnaires every four years to report their eating habits. The research team calculated the flavonoid content in food by using the flavonoid database from the US Department of Agriculture. Some of the women in the study consumed these compounds by drinking orange and grapefruit juice. However, the researchers mention that it is better to eat the whole fruit to increase intake of the healthy flavanones from citrus fruits. Researchers also concluded that it is better to eat the whole fruit instead of vitamin C supplements. 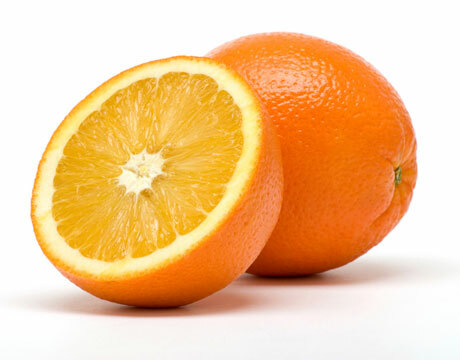 In their study, vitamin C did not correlate with reduction of stroke risk. They believe that flavanones such as naringenin and hesperetin may be responsible because they have strong anti-inflammatory properties. These compounds also have an impact on the production of nitric oxide which relaxes blood vessels. Previous research showed that flavonoids in oranges decrease cholesterol levels in the body. They also decrease your blood pressure. In a 2011 study published in the American Journal of Clinical Nutrition, researchers found that oranges have flavonoid compounds called hesperidin which reduce blood pressure and lower cardiovascular risk. All the volunteers in this hesperidin study were men; evidence that oranges are good for men's cardiovascular health as well. Since the link between citrus fruits and reduced stroke risk is based on an observational study, the study authors suggest that randomized trials are needed to confirm the association. Satish Lohani is an economist who is also interested in natural health and preventive medicine. He also writes forHealth on a Budget, which provides tips about living healthy and reducing health care costs.